Candle itself body height 2.6 inches, width 1.5 inches, Wick length 0.5inches, plastic stem length 2inches, total height is at least 4.9inches, Really big size candle are very conspicuous for your taking photos on cake when you are celebrating. Classial design with rhinestone inlay on one side of the candles surface, so no matter the remained part of candle after burn and qunech or a new candle you have never lighted on after you purchased, it have highly value for collecting, after many years later when you are old and find out the candles, you would feel the past memory is very precious and unforgettable, this never be bought by money, time flies!!! Bring fun and brightly experience to your special day, party and birthday, celebration days. 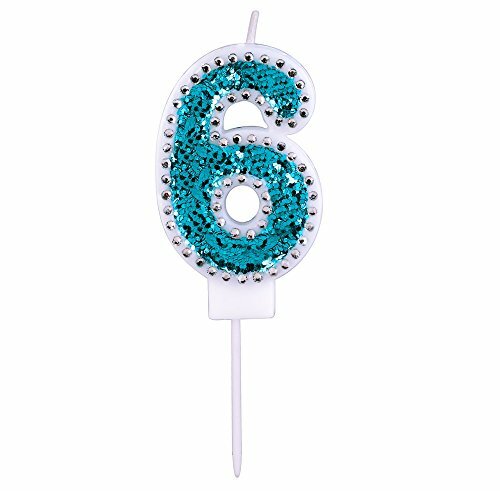 This candles with glitter powder and rhinestone only on the front surface, add more funny and decorating on the cake or topper when it light on. The glitter powder is not bad for your heathy, don't care glitter powder drop down on your cake; All the rhinestone and glitter powder are hand-made and adhered onto the candle one by one, might one or not more than 3 rhinestone and glitter powder dropping, hopefully you can understanding since you own an unique one candle in the world. Randomly select vintage,retro,modern or fashion style metal box to pack candles and wrapped with soft material, don't worry it will be damaged in transportation.Partner with willcan for the best in decorations for birthday parties, holidays and themed celebrations,Plastic stem allows you to place the candle anywhere. If you have any questions about this product by Willcan, contact us by completing and submitting the form below. If you are looking for a specif part number, please include it with your message.